The wines that are produced in the Missouri Wine Country have earned many awards and have been recognized both nationally and internationally as being excellent in quality. In fact, many people are pleasantly surprised to find out how good Missouri wines are! Augusta, New Haven, Washington, St. Charles County and Hermann have long histories of being wine producers. 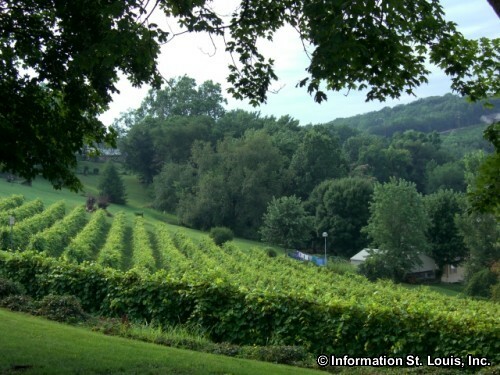 German immigrants came to Missouri in the mid 1800s and recognized the similarity of the land with their native country and planted vineyards. One winery, the Stone Hill Winery in Hermann Missouri, was established in 1847 by German immigrant Michael Poeschel. Before Prohibition, Stone Hill Winery was the second largest winery in the United States and third in the world! At that time, Missouri wine production was ony second to that of California. Unfortunately, Prohibition shut down all the wineries in Missouri except one in St. Louis that produced wine for religious purposes. It wasn't until the 1960s when new wine vintners replanted the vineyards and began producing wine. Stone Hill Winery was reopened as well as two others that had been established in the 1880s by those first German settlers. Missouri now ranks 10th in the United States in wine production. The cities of Augusta, New Haven, Washington, Hermann and the surrounding acres fall within an American Viticultural Area (AVA), the Ozark Mountain AVA, which is a designated wine grape growing area in the United States that has similar climate, geology, soils, physical features or elevation. The United States has about 200 AVAs that are designated by the Alcohol and Tobacco Tax and Trade Bureau. The Augusta AVA, a 15 square mile area which falls within the Ozark Mountain AVE, was the first recognized AVA in the United States and received the status in 1980, months before any California AVAs! The Missouri State wine grape is the Norton grape, but some of the other varieties of wine grapes that are produced in the Augusta AVA are Cabernet Sauvignon, Vignoles, Chambourcin, Seyval Blanc, Vidal Blanc and the Chardonel. The near the city of Hermann, the Hermann AVA is located which covers 51,200 acres and was established in 1983. Below is a list of wineries that can be found in St. Charles County.